Plymouth’s Old Palace Theatre – home in the late 1960s to the Pussycat Club which was managed by one the city’s longest standing gay couples Paul Pollard and Ted Spring. The Palace Theatre became the Dance Academy in 1980’s and hosted ‘BOLTS’ a weekly gay night held on a Monday. Article from Western Evening Herald, 28 May 1965. In 1956, Section 13 of the Sexual Offences Act created the offence of Gross Indecency between two men – defining the undefined immoral acts that the Criminal Law Amendment Act had found too distressing to spell out in 1885. This led to a rise in police activity against homosexuals and homosexual behaviour. It also caused the creation of more secretive gay subcultures around the UK as gay people sought out spaces where they felt safe to express themselves. An underground scene developed in Plymouth. Many people seemed prepared to turn a blind eye to homosexuality despite the prevailing laws of the time. Men used to dance with each other in the Paramount Dance Hall with little or no reaction and the Lockyers Tavern’s back bar became famous to those in the know. 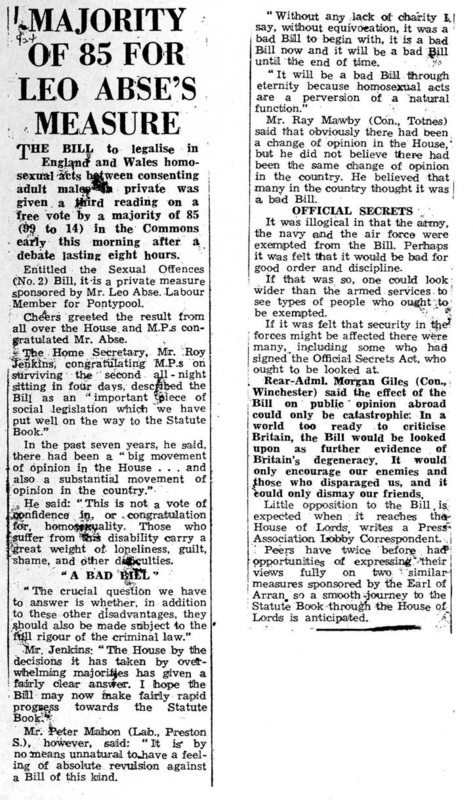 In 1957 theWolfenden Report was published after a succession of well-known men were convicted of homosexual offences. Its recommendation was that, “homosexual behaviour between consenting adults in private should no longer be a criminal offence”. It also found that “homosexuality cannot legitimately be regarded as a disease, because in many cases it is the only symptom and is compatible with full mental health in other respects.” A decade of campaigning for an end to the criminalisation of homosexuality followed. Eventually the Sexual Offence Act become law in 1967. This decriminalised homosexual acts in private for consenting adults over 21.
activists up until her death in 2010.